We were cool as mustard custard. We’d established this fact with the Big Wednesday Wave. We’d seen them, hit them head on and ridden through a few now. But these had all been inland so it only seemed right to go and find some real waves down at the beach. After all, isn’t that where V-Dubs are supposed to hang out? Down at the surf. V-Dubs, hanging out and the surf? I don’t really go for the cool slang, unless it’s my own, which by definition, some might say, isn’t cool. Without meaning to sound pretentious, the phrase “V-dubs” I kind of like but the dubs bit is short for dubya which is synonymous with a certain ex-American president which grates me a little. I don’t really hang out either. Apart from the washing. I hang that out. In fact if I’m in a particularly mean mood I hang the washing out to dry. And as for the surf, what is that? The white frothy stuff on top of a breaking wave? When wading into the sea off the British coast it’s the bit of the incoming wave that causes you to freeze in horror and make you wish you could levitate a couple of inches to avoid the inevitable kissing of cold wet water against the underside of your notcha’s. That’s the closest I’ve been to catching the surf. But in any case, we were off to the beach to hang out and see whether any other v-dub hanger outers were catching the surf. 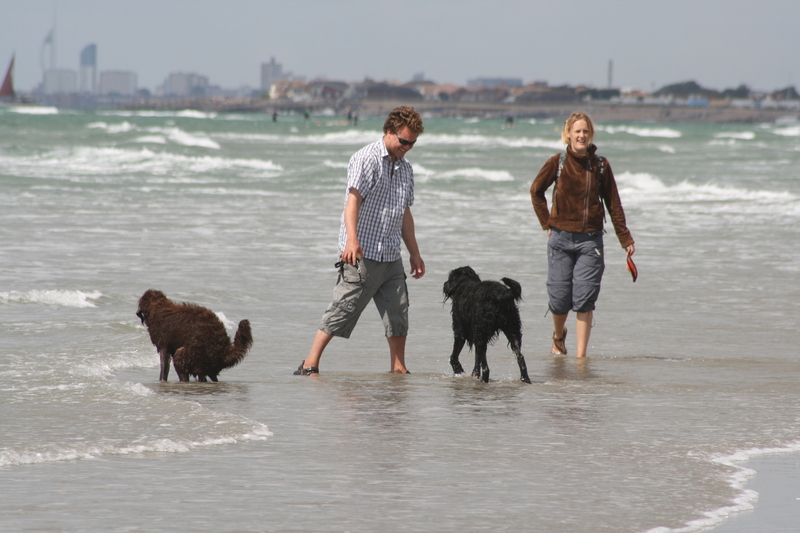 Our nearest beach is West Wittering and is about 35 miles due south, as the crow flows, on the West Sussex coast south of Chichester, which is also known as Chich by the locals. In the same way that Winchester is known as Winch, Manchester is known as Manch and Chester is known as Ch. We’d been to Wittering before. It’s got miles and miles of wide flat sands with a shallow tide and is great for taking the dog for a splash. You can find your own space to run around avoiding the families who crowd the beach near the car park. The best thing about Britain’s beaches are their cleanliness. Nice one Conker! Note I said West Wittering – not East. We all know west is best and east is least. Don’t we? Don’t make the mistake of going to East Wittering. We camped there once, before we had a tin tent and the campsite was rubbish. A bit of a slur for East Wittering perhaps, but that’s how we remember it – that place with a rubbish dump campsite and eco toilets which were basically holes in the ground where you’re invited to cover your message with some kindly provided saw dust and then let nature do the rest. I remember the instruction notice saying don’t sprinkle too much saw dust as that’s not good for the process. It costs a whopping seven quid to get into the West Wittering car park, which is just a big flat grassy field. But being British we all queue on entry and when we do get in we set up a picnic, in the car park, before we head for the beach. That’s right. It’s quite common to have a picnic in the car park. Common as in a frequent occurrence, not common as in social standing. Although I expect it is common for commoners to picnic in car parks. If not to picnic then at least to nick. As is the want of someone who is a bit common. Although there shouldn’t be too many commoners at West Wittering though. Not at £7 a pop. Unless, of course, they’ve found a sneaky way in round the back where they don’t have to pay. And I bet they have too! I don’t think I’ve generalised too much there have I? Actually, having a picnic in the West Wittering car park is not as stupid as it sounds. It is grassy and cars do park far enough apart so you can mark out your own space. And some do. With wind breakers and deck chairs and small children. Our big day trip to the beach was shared with Alex, a friend of ours who’s the owner of Logan – a labradoodle like Conker, but bigger. Imagine Dave Lee Travis in a Chewbacca suit and that’s Logan. A Big Hairy Cornflake from Outerspace. Logan is a big lopey dopey dog and his owners, Simon and Alex, love him very much. Lopey Dopey he might be, but to be fair he’s won many a dog fight flying in his Millenium Falcon. Alex is a girl, but with a boy’s name. She has a girls’ haircut and wears girls’ clothes and wears jewellery and talks girly stuff, so don’t be confused by the name. On the other hand, Simon is a boy with a boy’s name. Nice and simple. (The analogy that is). Once we’d parked up and before we got our food out we tethered the dogs to stop them nicking ours and other people’s sandwiches. And they will. Oh yes, they will. I blame the dog owners when this happens. It makes me laugh when you hear some people say ‘why can’t you control your dogs’ especially when you consider the combined weight of Logie Bear and Conker Jonks is 75kg+ and when they get going they take some stopping. A thick tree trunk can do it if they run into it hard enough. And they do sometimes, with their heads locked in a double neck bite. As we ate our sannies in the car park we noticed a bright yellow Type II tin top. We recognised it from a previous visit to the beach. From a time before we’d bought ours. A time when we were thinking of buying one. We’d spoken to the owner then and that gave us a bit of a spark to go buy one ourselves. So we spoke to him again, but this time proudly showing off our mustard mobile. He was impressed but then that’s part of the deal between VW owners, to be impressed by other owner’s V-dubs. Self infatuation you could say. And we weren’t the only V-dubs on show today. Two others rocked up and parked next to us. One was a like ours, not quite pristine and perhaps in need of a good spring clean and the other was entirely pimped. It had been converted into a pickup truck with an open back, lowered suspension, blacked out windows, spray paint job with tattoo style colours emblazoned down its sides and shiny alloy sports car style wheels. The proud owners of this dream machine then took time out to stop and have a good look at ours – peering through the windows even though we were sat just 10 feet away. It’s an infection it seems, almost an uncontrollable urge to take a close look at another V-dub. I don’t know what it is about v-dub owners, but the intrusion is almost welcomed as the curiosity is seen more as a compliment than someone just being nosey. We were learning more and nore about what it is to own a v-dub and the community it belongs too. I think I’ll revert back to calling it a bus. V-dub just sounds stupid. Any sentence that begins with the words without meaning to sound pretentious automatically makes you sound pretentious. I say that with all due respect. Notcha’s. Definition: A Notcha is the bit between your front private bits and your back private bits. For a man, it’s notcha arse and notcha balls. For a lady its notcha botty and notcha lady’s front botty. People from Chester often sound like they have a speech impediment when asked where they come from. Where do you come from? You might ask. Ch they might answer. Ch? Where’s that then? Ch.. Come on man, spit it out. For those who have studied geotechnics and slip-circle analysis, I’m sure you’d be interested to know the slip circle properties of a pile of poo. Pretty darn good if you ask me. No matter how steep the sides of the poo mountain already are you just know yours will come to rest on the top of the pile and stick. I’d like to know if Newton had a law for that. This entry was posted in The SapaBus Blog.